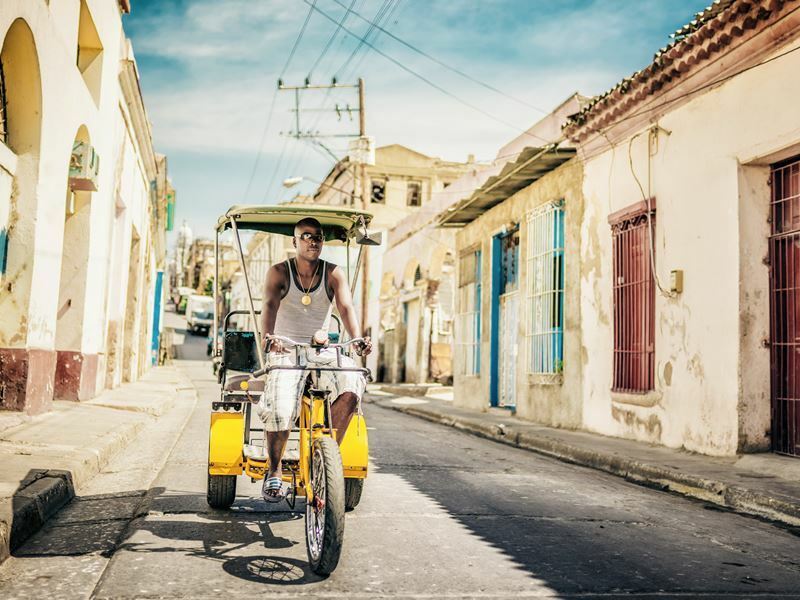 Cuba is becoming an increasingly popular destination, with many visiting for the chance to step back in time. If you hope to do the same, plan to do it sooner rather than later, before McDonalds and Starbucks move in. For now, you’ll be able to see city streets filled with cars from the 1930's, 40's and 50's in mint condition, and experience a wealth of fascinating attractions in the country’s historical cities. 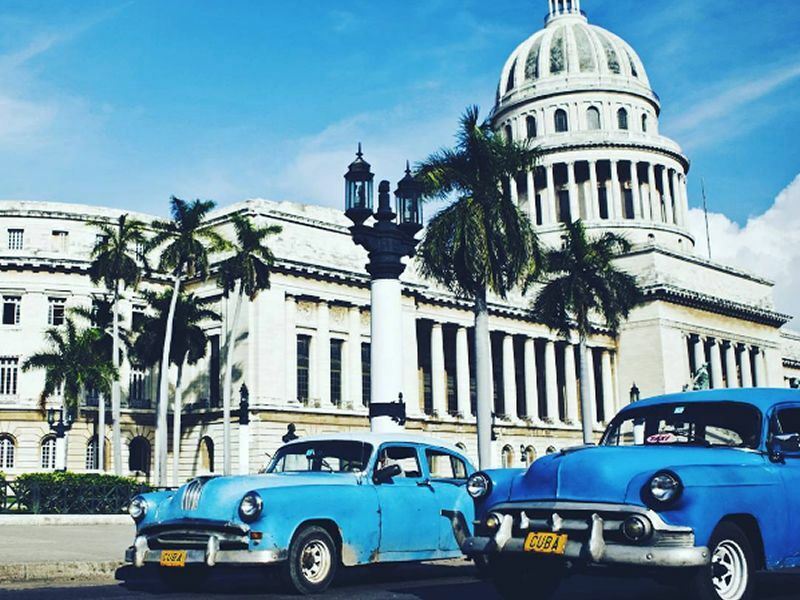 Founded in 1519 by Spanish colonists, Havana is famous for its many vintage vehicles, and you can even take a guided tour in one straight from the airport. Once you arrive into the capital city, you’ll feel as if you’ve stepped into a time machine, surrounded by magnificent colonial facades that have barely changed over the decades. Seeing them from a classic car adds to the experience, and you’ll be able to learn about their history and many of the city’s landmarks from your driver guide. There are many other ways to explore Havana’s rich history, including a visit to Castillo de la Fuerza, the “Castle of the Royal Fort. 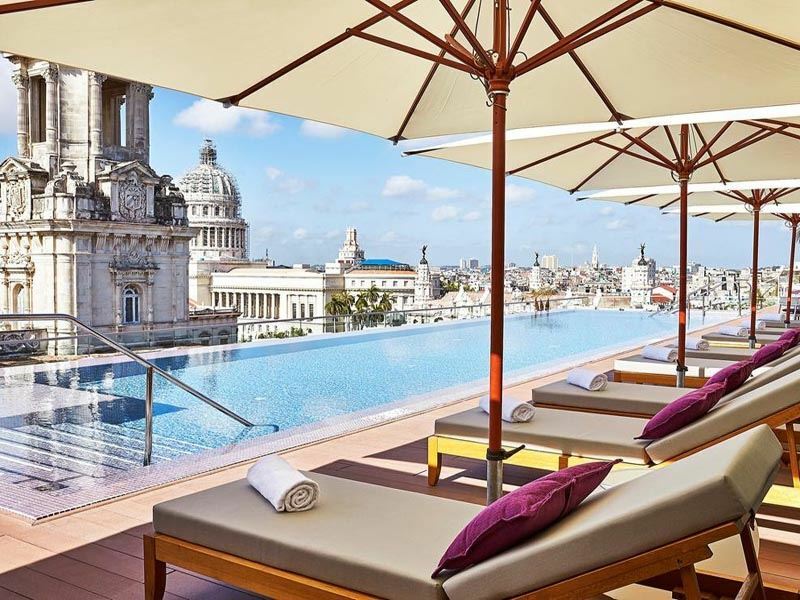 Located in old Havana, it’s one of the most popular attractions in the city and the oldest stone fort in the Americas. Constructed by the Spanish in the 16th century to defend Havana from pirate invasions and rival powers, today it serves as a maritime museum that showcases exhibits focused on Cuba’s maritime past from the pre-Columbia days through the 18th century. You can also get a bite to eat and pick up souvenirs as it hosts both a café and gift shop. El Morro, which dates all the way back to the early 17th century, sitting atop the promontory across from Old Havana, offers the chance to visit the first defensive fortress that was put in place by the Spanish Crown. It can be seen for miles around dominating the port entrance. Today, it’s an ideal spot to watch the sun go down as well as to witness the cannon shot ceremony which takes place every evening at 9 p.m., a reminder of the time when this was a walled city where a cannon was shot each day at sunrise and sunset, signalling the opening and closing of the gates. Get a historical context of modern Cuba by visiting the Museum of Revolution, set within a former presidential palace. The Museo de la Revolucion provides a fascinating, but partisan, look into the country’s political past through exhibits that follow the events leading to Fidel Castro gaining control of Cuba. Among its highlights are a life-size wax statue of Che Guevara and Camilo Cienfuegos, historic photographs, models of battles, period firearms and a giant revolutionary mural. You may also want to check out Old Havana’s historical landmarks like the Cathedral of Havana, the Great Theatre of Havana and La Cabana. If you’re a history and literary enthusiast, you can also walk in the steps of author Ernest Hemingway who spent much of his time in the city back in the 1940's and 50's. Enjoy sipping cocktails at some of the same bars Hemingway himself once drank, like El Florditia, where very little has changed from the days he often sat with the likes of Gary Cooper or Errol Flynn. If you’re a big fan of the literary icon, you may want to stay at the Hotel Ambos Mundos where Hemingway penned part of For Whom the Bell Tolls. 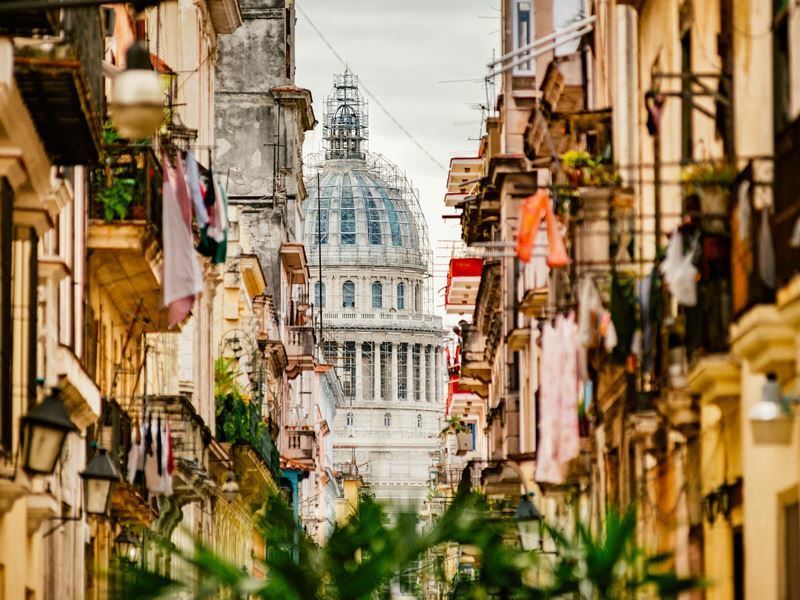 Other great options to complement your tour of this historical city include the Saratoga, a boutique hotel in the heart of Havana that evokes the glamour of the 30's, or Hotel Manzana Kempsinki, originally built between 1894 and 1917, set in the centre of the Old City offering impressive views of the Capitol Building and the Great Theatre of Havana. Pinar del Rio is both the westernmost province of Cuba, and a city that serves as the capital of the Pinar del Rio province. It’s the centre of the cigar industry, set in a major tobacco-growing area and was one of the last major cities to be founded by the Spanish back in 1867. While you’re here you can visit the La Catedral de Pinar del Rio a lovely historic church, as well as the Alejandro Robaina Tobacco Plantation for a fascinating look at the heart of western Cuba’s tobacco industry, especially during the tobacco-growing season, between November and February, and to sample the finest tobacco directly from the source. 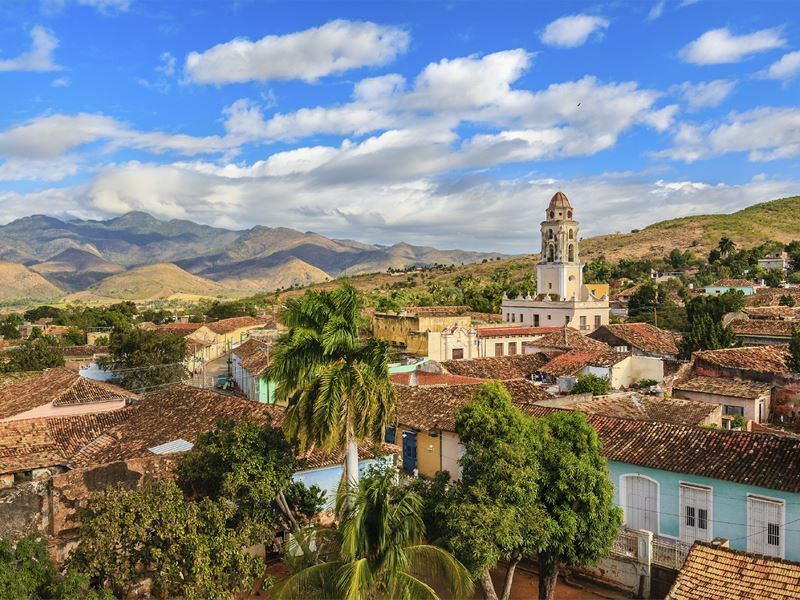 The main reason to visit the Pinar del Rio province is the village of Vinales, founded in 1875 following the expansion of tobacco cultivation in The Valley, which was also the site of a number of military engagements during the Cuban Revolution and Cuban War of Independence. 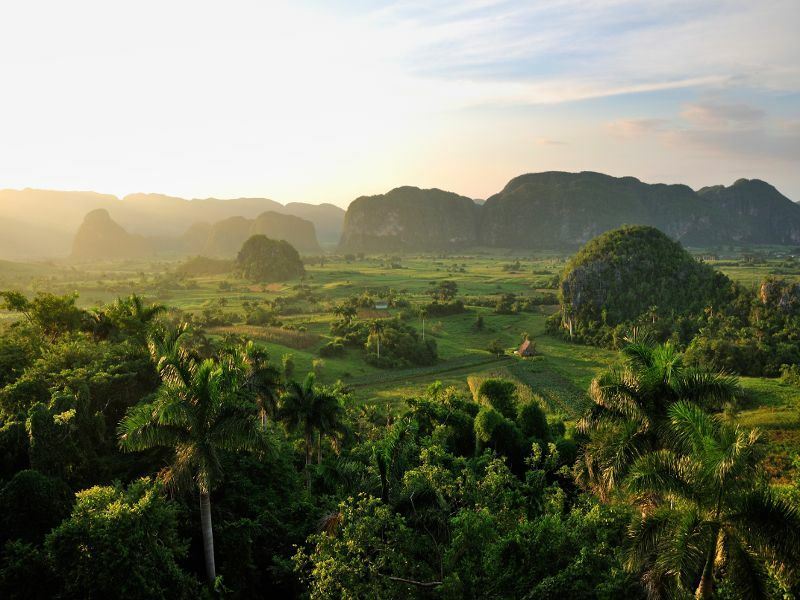 One of Cuba’s most beautiful towns, it’s best known for its limestone hills and tobacco farms. The farms are the best place to purchase cigars in Cuba, with deeply discounted prices. Vinales is also a great place to stay with a Cuban family in a Casa Particular for a more authentic experience with over 80% of the homes here opening their tours for tourist accommodation. All you have to do is knock on one of the doors that has a sign with a name on it and ask about availability – it’s a great way to learn about the daily lives of the locals. Soroa is also known as Cuba’s Rainbow. It’s best known for its bird watching opportunities and beautiful, lush scenery with frequent rains contributing to the growth of trees and orchids. Be sure to visit the El Salto del Arco Iris, a 72-foot-tall waterfall set in a lush, tropical forest. On the other side of the falls are the Roman baths. Another must-experience is the Soroa Orchidarium which hosts the largest collection of orchids in the country with 130 species of autochthous orchids and nearly 700 international types. It’s listed as a National Heritage site and is part of the Biosphere reserve of Sierra del Rosario. The sleepy capital city of the province of Villa Clara, Santa Clara is home to the mausoleum for the fallen of the Revolution, which includes Che Guevara himself. Less than an hour east of the city centre is the site of one of the most important battles in Cuban history: Monumento a la Toma del Tren Blindado,” the spot where Che Guevara and his men ripped up the railway line, and derailed the armoured train, defeating the men inside. Here you can see the actual bulldozer that was used, and several train carriages in situ. The carriages themselves also feature a number of exhibits. 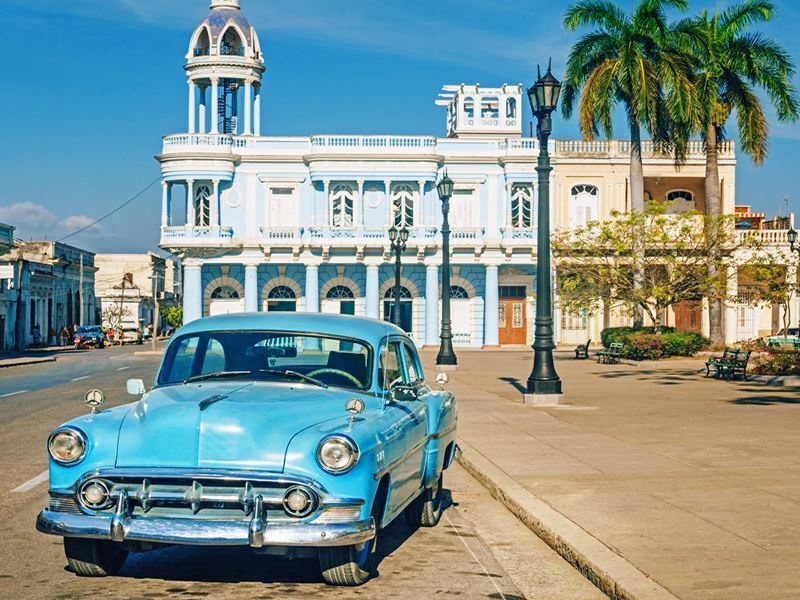 The “Pearl of the South” and capital of Cienfuegos Province sits on Cuba’s southern coast, founded in 1819 as a Spanish colony, although it’s the only city in Cuba that was established by the French. It was once the trade centre for sugar cane, coffee and tobacco due to its location on Cienfuegos Bay, and today is known for its colonial-era buildings along with more modern influences. Be sure to visit the Victorian Tomas Terry Theatre, built in 1890 with many of its original features still intact, and the Museo Historico, a historical museum focused on everything from archaeology to the colonial era. One of the best overnight stays here can be enjoyed at the La Union Hotel, built in 1869 as a grand colonial mansion. Known as the “museum city,” Trinidad was founded in the early 16th century and has remained meticulously well-preserved, almost as if it was frozen in time in the late 1800's. 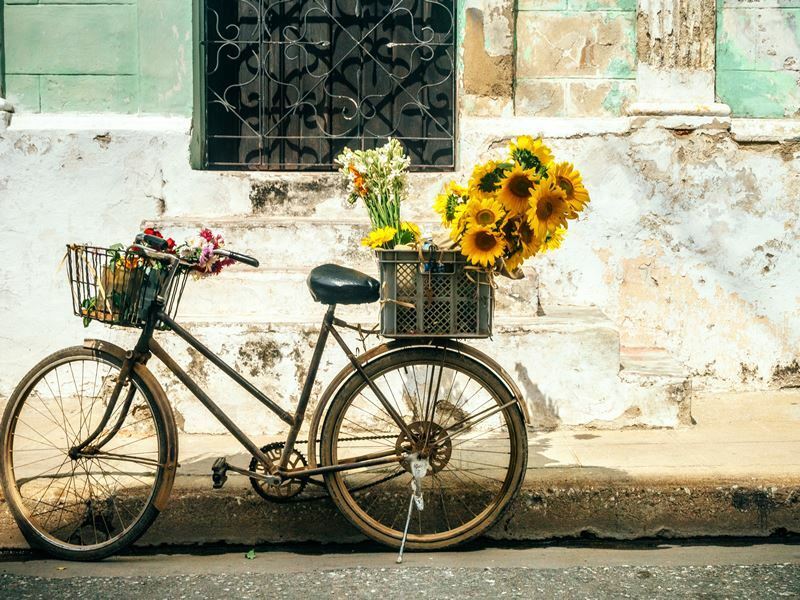 Today, you’ll see locals riding horses down the cobbled streets and discover everything from attractive plazas and massive colonial palaces to old slave barracks and sugar mill ruins. In fact, the city prospered through the colonial period primarily because of the local sugar industry. Walk the streets and marvel at the Spanish colonial architecture, and step inside the elegant mansions that now serve as museums. When you’re in need of a break, pop into one of the rooftop restaurants to dine on delectable fresh seafood and while listening to live local tunes. The Iberostar Grand Hotel is an ideal place to lie down for the night and continue your immersion into classical colonial architecture and décor, combining luxury with traditional Cuban history. While you’re here, you probably don’t want to miss the chance to relax on one of the unspoiled white sand beaches in Casilda Bay or snorkel among colourful fish in the crystal-clear waters. The third largest city in Cuba, Camagüey was one of the first villages in Cuba founded by the Spanish. Originally settled in 1528, note its maze-like style, unlike most other orderly Spanish settlements. It was influenced by medieval European ideas and traditional building methods, used to help ward off the frequent bandit and pirate attacks. 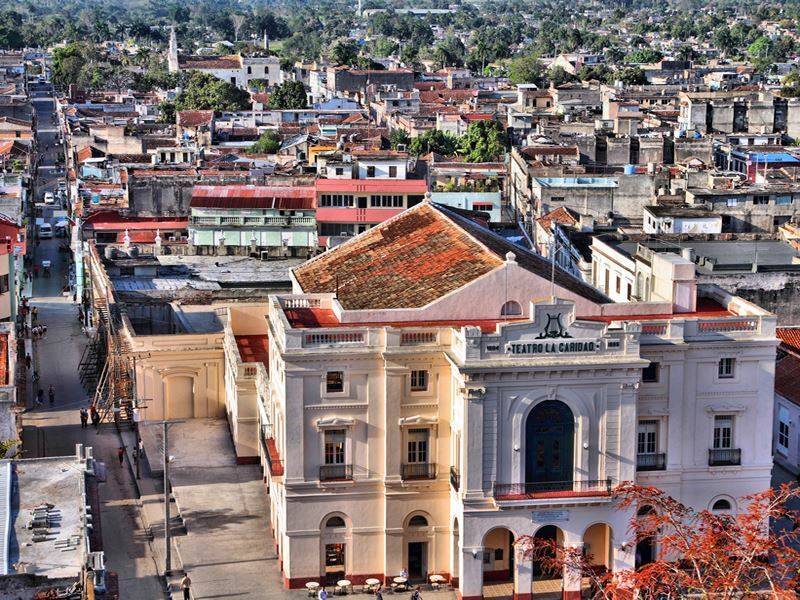 It’s easy to get lost here with the twisting, turning streets intersecting at odd angles, but walking around the historic centre is really the best way to get to know Camagüey and all of its interesting nooks and crannies. 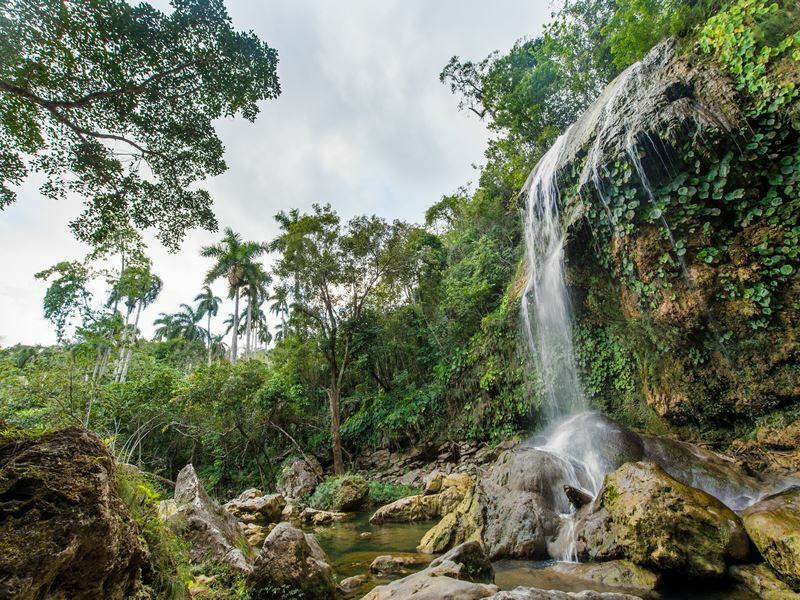 The romantic “second city,” is situated at the eastern end of the Sierra Maestra, the largest mountain range in Cuba. While it’s often overlooked, this cultural capital is one that’s not to be missed with a rich colonial heritage that can be experienced throughout the historical core. While there is plenty of history buffs, music is really the city’s main allure. The scene is exciting year-round, but in July it’s even more vibrant, with the Fiesta del Caribe hosted. Everywhere you go you’ll view spectacular costumes and hear the sounds of song and rumba beats. If you want to stick around, you may want to stay at the Melia Santiago De Cuba, the only five-star hotel in town and a symbol of the city known for its exclusivity and exceptional service as well as its picturesque city views with the Sierra Maestra as the backdrop. 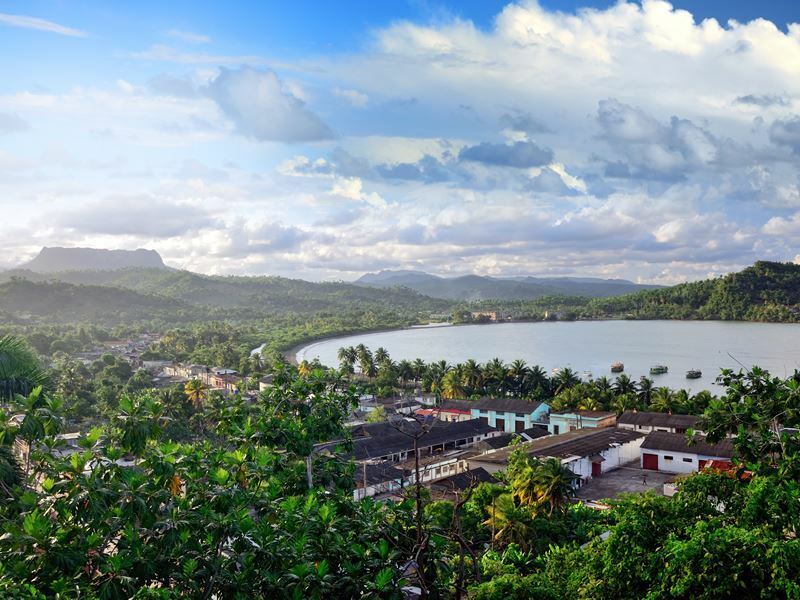 Located near the eastern tip of Cuba on the Bay of Honey, Baracoa is the country’s oldest and most isolated town that some call its very best kept secret. Founded two decades after Christopher Columbus visited in 1492, it has an air of magic and a decidedly charming historic atmosphere. Here you can hike mountains and lounge on powdery soft sand beaches as well as explore Indian remains and even visit one of the old Taino chiefs in the archaeological museum, where the remains of Chief Guama are reportedly held. Baracoa is also the leading producer of chocolate in the country, with a number of the local factories offering tours so you can see just how raw cocoa is transformed into chocolate and buy some to enjoy too. 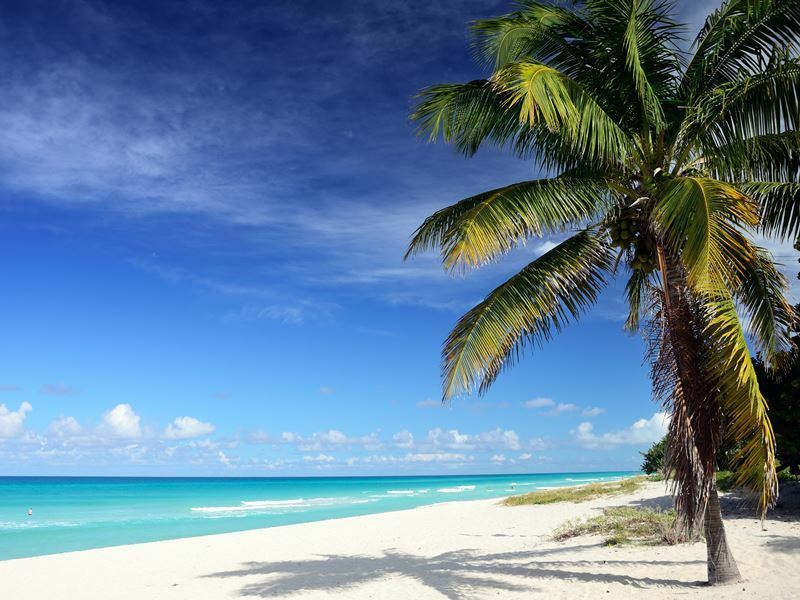 Varadero is a resort town and one of the largest resort areas in the Caribbean, located on the Hicacos Peninsula between the Bay of Cardenas and the Straits of Florida. Though it was mentioned as early as 1555, it wasn’t officially founded until 1887. Visit Parque Josone, where you can mingle with locals out enjoying a stroll, and the mansions that have been transformed into art galleries and museums. The beach is very special too.